The government has decided not to abolish 12 of the 53 allowances which were recommended to be abolished by the 7th CPC. Also, three of the 37 allowances recommended to be subsumed by the 7th CPC will continue as separate identities. Its implication is that over one lakh employees belonging to some categories in railways, posts, defence and scientific departments will benefit. HRA is currently paid at 30% for X (population of 50 lakh and above), 20% for Y (5 to 50 lakh) and 10% for Z (below 5 lakh) category of cities. 7th CPC recommended reduction in the existing rates to 24% for X, 16% for Y and 8% for Z category of cities. As the HRA at the reduced rates may not be sufficient for employees falling in lower pay bracket, it has been decided that HRA shall not be less than ₹5400, ₹3600 and ₹1800 for X, Y and Z category of cities respectively. This floor rate has been calculated at 30%, 20% and 10% of the minimum pay of ₹18000. This move will benefit more than 7.5 lakh employees belonging to Levels 1 to 3. Also, 7th CPC had recommended that HRA rates will be revised upwards in two phases to 27%, 18% and 9% when DA crosses 50% and to 30%, 20% and 10% when DA crosses 100%. The government has now decided that these rates will be revised upwards when DA crosses 25% and 50% respectively. This means, the employees who do not reside in government accommodation and get HRA, will benefit the most. 7th CPC had placed Siachen Allowance with two slabs of ₹21,000 and ₹31,500. But the government has decided to further enhance the rates of Siachen Allowance. It will now go up from the existing rate from ₹14,000 to ₹30,000 per month for Jawans and JCOs (Level 8 and below) and from ₹21,000 to ₹42,500 per month for Officers (Level 9 and above). At present, various types of allowances are paid for provisioning and maintenance of uniforms/outfits such as washing allowance, uniform allowance, kit maintenance allowance, outfit allowance etc. These have been rationalised and subsumed in newly proposed dress allowance to be paid annually in four slabs: ₹5000, ₹10,000, ₹15,000 and ₹20,000 per annum for various category of employees. This allowance will however continue to be paid to nurses on a monthly basis in view of high maintenance and hygiene requirements. 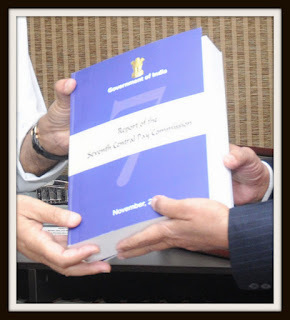 Significantly, the government has decided to pay higher rate of dress allowance to SPG personnel keeping in view the existing rates of Uniform Allowance paid to them (which is higher than the rates recommended by the 7th CPC) as also their specific requirements. Some allowances based on geographical location such as special compensatory (remote locality) allowance (SCRLA), Sunderban Allowance and Tribal Area Allowance have been subsumed in Tough Location Allowance (TLA). The areas under TLA have been classified into three categories and the rates will be in the range of ₹1,000 to ₹5,300 per month. The 7th CPC had recommended that TLA will not be admissible with Special Duty Allowance (SDA) payable in North-East, Ladakh and the Islands. But the government has decided that employees will be given the option to avail of the benefit of SCRLA at pre-revised rates along with SDA at revised rates. A) Rate of Children Education Allowance (CEA) has been increased from ₹1,500 per month per child (a maximum of 2) to ₹2,250 per month per child. Hostel subsidy will also go up from ₹4,500 per month to ₹6,750 per month. B) Existing rates of Special Allowance for Child Care for Women with Disabilities has been doubled from ₹1,500 per month to ₹3,000 per month. C) Higher Qualification Incentive for Civilians has been increased from ₹2,000 - ₹10,000 (Grant) to ₹10,000 - ₹30,000 (Grant). 7. Allowances for defence, CAPFs, police, Indian Coast Guard etc. A) The 7th CPC had recommended abolition of Ration Money Allowance (RMA) and free ration to Defence officers posted in peace areas. It has been decided that Ration Money Allowance will continue to be paid to them and directly credited to their account. It will benefit 43,000 defence officers. B) Technical Allowance (Tier - I and II) are paid to defence officers belonging to technical branches at ₹3000 per month and ₹4500 per month. 7th CPC has recommended that Technical Allowance (Tier - II) be merged with higher qualification incentive for defence personnel. The government has decided not to discontinue technical allowance. C) The facility of one additional free railway warrant (Leave Travel Concession) presently granted to personnel of defence forces serving in field/high altitude/CI Ops shall also be extended to all personnels of CAPFs and the Indian Coast Guard. D) Rates of high altitude allowance granted to defence forces and CAPF personnel will go up from ₹810 - ₹16,800 per month to ₹2,700 – ₹25,000 per month. E) Field area allowances are granted to Indian Army, Air Force and CAPF personnel. The rates of field area allowances will go up from ₹1,200 - ₹12,600 per month to ₹6,000 ₹16,900 per month. Classification of field areas for this allowance will be done by ministry of defence for defence personnel and by ministry of home affairs for CAPFs. F) The rates of counter insurgency ops (CI Ops) allowance, granted to defence and CAPFs while deployed in counter–insurgency operations go up from ₹3,000 - ₹11,700 per month to ₹6,000 – ₹16,900 per month. G) Rates of MARCOS and chariot allowance granted to marine commandos of Indian Navy will go up from ₹10,500 - ₹15,750 per month to ₹17,300 – ₹25,000 per month. H) The 12-hour conditionality for determining the eligibility of Sea Going Allowance for Indian Navy personnel has been reduced to four hours. The rates will go up from ₹3,000 - ₹7,800 per month to ₹6,000 – ₹10,500 per month. I) Rates of commando battalion for resolute action (COBRA) allowance granted to CRPF personnel deployed in Naxal hit areas will go up from ₹8,400—₹16,800 per month to ₹17,300 — ₹25,000 per month. J) Rates of flying allowance granted to flying branch and technical officers of defence forces will go up from ₹10,500 — ₹15,750 per month to ₹17,300 — ₹25,000 per month. K) Rates of higher qualification incentive for defence personnel have been increased from ₹9,000 — ₹30,000 (Grant) to ₹10,000 — ₹30,000. L) Aeronautical allowance, presently paid to personnel of Indian Navy, has been extended to Indian Coast Guard. The rate of this allowance has been increased from ₹300 per month to ₹450 per month. M) Rates of test pilot and flight test engineer allowance will go up from ₹1,500/₹3,000 per month to ₹4,100/₹5,300 per month. N) Rates of Territorial Army Allowance have been increased from ₹175 — ₹450 per month to ₹1,000 — ₹2,000 per month. O) Ceilings of Deputation (Duty) Allowance for defence personnel have been increased from ₹2,000 - ₹4,500 per month to ₹4,500 - ₹9,000 per month. P) Rates of Detachment Allowance have been increased ₹165 - ₹780 per day to ₹405 – ₹1,170 per day. Q) Rates of para jump instructor allowance have been increased from ₹2,700/3,600 per month to ₹6,000/10,500 per month. A) Rates of additional allowance have been increased from ₹500/1000 per month to ₹1,125/ 2,250 per month. This has also been extended to loco pilot goods and senior passenger guards also at ₹750 per month. B) New allowance called Special Train Controller’s Allowance at ₹5,000 per month for train controllers of railways has been introduced. Rate of Fixed Medical Allowance (FMA) for pensioners has been increased from ₹500 per month to ₹1,000 per month. This will benefit more than 5 lakh Central government pensioners not availing CGHS facilities. The recommendations of 7th CPC to abolish Launch Campaign Allowance and Space Technology Allowance has not been accepted. In order to incentivize the supporting employees in space and atomic energy sector, the rate of Launch Campaign and Space Technology Allowance has been increased from ₹7,500 per annum to ₹11,250 per annum. Professional Update Allowance for non-gazetted employees of Department of Atomic Energy will also continue to be paid at the enhanced rate of ₹11,250 per annum.